She goes in and out and in and out and in and out and in and out. What instruments are comparable to accordions? New Models just arrived from famous Italian Accordion Makers! Sensational new ideas! Modern new styling! new features! Buy direct from Importer—save up to one-half! 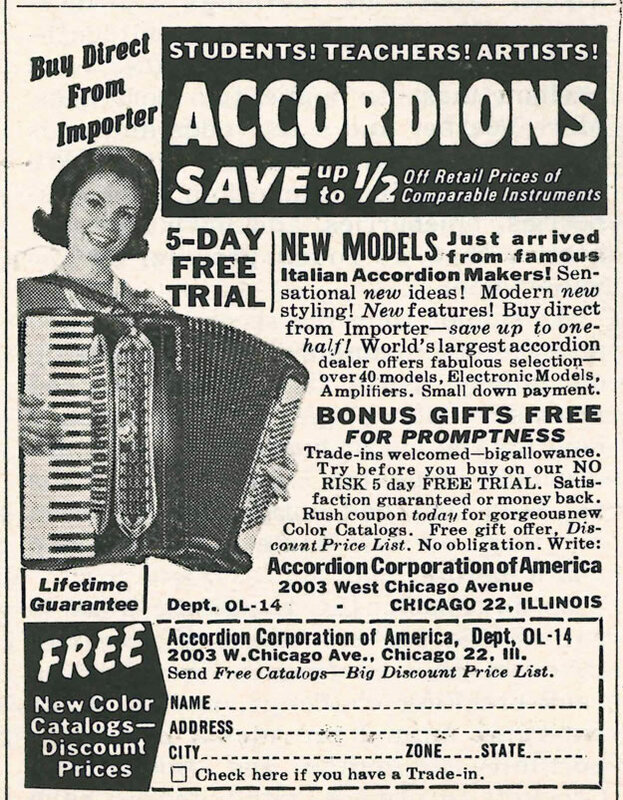 World’s largest accordion dealer offers fabulous selection—over 40 models, Electronic Models, Amplifiers. Small down payment. This entry was posted in ads of yore and tagged accordions, ads, advertising, magazine ads, musical instruments, print ads, vintage, vintage ads on January 11, 2017 by Clayton Hove.